Let this great wonder of nature remain as it now is. You cannot improve on it. as the one great sight which every American should see. The Grand Canyon—one of the world’s natural wonders—is one of the most astonishingly beautiful places on Earth. On January 11, 1908, President Theodore Roosevelt declared it a national monument. It took many years for the place to become a national park. People were talking about it as far back as the 1880s, but Arizona—where the Grand Canyon is located—didn’t join the Union of States until February 14, 1912. Congressional bills, to make the famous canyon a national park, had failed before 1919. Finally, in 1919—three months after the end of World War One—Congress passed a bill to make the Grand Canyon a national park. President Woodrow Wilson made the law official when he signed the bill on February 26, 1919. The South Rim, at about 7,000 feet above sea level, is the most accessible. The North Rim, at about 8,000 feet above sea level, is harder to explore (especially in winter when bad weather shuts-down access roads). 21 miles (by foot, using the Kaibab Trails). The Grand Canyon itself influences weather. Tremendous changes in elevation cause large gradients in temperature and precipitation. The coolest, wettest weather station in the region (Bright Angel Ranger Station on the North Rim) is less than eight miles from the hottest and one of the driest stations (Phantom Ranch). The coldest temperature recorded was –22° F on the North Rim on February 1, 1985. The warmest was 120° F at Phantom Ranch on several dates. The North Rim is also the wettest location, with an average of 25.8” of moisture a year (45.03” in 1978). Lees Ferry is the driest, averaging only 6.1” of yearly precipitation (and only 2.7” in 1955). Deep canyons and rough terrain strongly influence solar heating and air circulation. Consequently, many different microclimates are found throughout the canyon. In general, temperature increases 5.5° F with each 1,000 feet loss in elevation. The highest temperatures are found at the lowest elevations inside the canyon. Low relative humidity and generally clear skies mean that most of the sun’s energy is available for daytime heating. These same conditions lead to rapid heat loss at night. Consequently, daily temperature swings are large. During the dry early summer, average monthly highs are more than 30 degrees warmer than average lows at all stations except Pearce Ferry. Individual days may show even greater swings. Winter precipitation usually falls as snow on the rims, but melts to rain before reaching the canyon floor. The North Rim receives the heaviest snowfall, averaging 142” per year, with a record snowfall of 272.8” (almost 23 feet) in 1978. The South Rim averages 58” of snow, and Phantom Ranch less than 1”. Moisture for these winter storms generally comes from the North Pacific. Late spring and early summer are the driest times of the year, with relative humidity often falling below 10% during the day. By mid-summer, heating over the Southwestern deserts draws moist air from the Gulf of Mexico and the Pacific Ocean/Gulf of California. The relative contributions from each ocean are debated. Moisture generally approaches the Grand Canyon region from the south or southeast to produce the late summer “monsoon” season. Days often begin clear, but clouds build by mid-morning. Strong ground-level heating creates updrafts of warm air, which climb tens of thousands of feet producing powerful thunderstorms whenever there is sufficient atmospheric moisture. At times rain falling from these thunderheads evaporates before it can reach the ground, appearing as veil-like virga trailing from the cloud base. Lightning from these dry thunderstorms can ignite forest fires. Other thunderstorms produce localized but intense downpours, triggering flash floods in canyon tributaries. Such floods can arrive in the canyon bottom without warning. The rushing floodwaters may be the first indication of heavy rains at rim level. The photo, at the top of this page, depicts the Grand Canyon as it appears from Pima Point. “Colorado River and Phantom Ranch from South Kaibab Trail, Grand Canyon National Park,” as it appeared on October 24, 2004. Photo by James (also known as “Notary137." Online via Wikimedia Commons. Released into the public domain by the photographer. Snow-covered Grand Canyon by Pescaiolo on February 23, 2008. Released by photographer into the public domain via Wikimedia Commons. 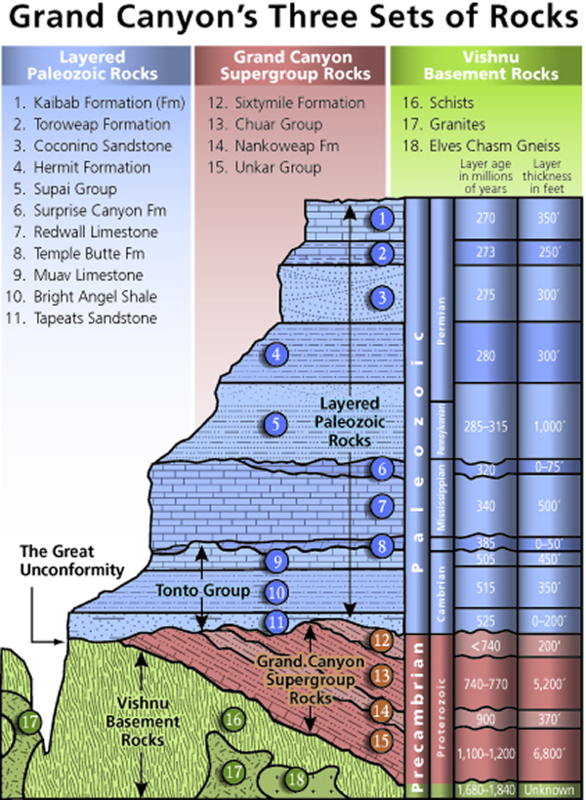 Diagram, depicting the stratigraphy of the Grand Canyon, from the U.S. National Park Service (also online via Wikimedia Commons). Public Domain. Bos, Carole "Grand Canyon As a National Monument" AwesomeStories.com. Dec 31, 2016. Apr 24, 2019.